Chris Chudada loves seeing the young athletes at his camps interact with the NFL Alumni Heroes. He finds the presence inspires the kids as they see individuals who have played at the highest level and were very successful. 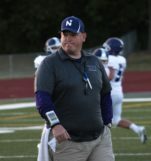 Chudada’s coaching experience also comes from his work with the Kettle Moraine School District where he has developed a coaching philosophy which he hopes teach his players to never give up. He pushes his young athletes to expectations they never thought they were able to accomplish.By constantly motivating them and pushing them to do their best they figure out that all that hard work pays off in the end. After playing football his whole life, from high school to college to semi-pro, Chudada found his passion for the game still burned bright. Now, he enjoys staying connected with the football by taking all of his years of knowledge and expertise and giving back to today’s upcoming players. Through mentorship and being a motivator, Chudada has seen many of his players experience incredible success. They all have one thing in common: a great work ethic. He loved seeing the heart and determination in each of these players and stays in contact with all of his ex-players today. Want to join Chris Chudada at camp?